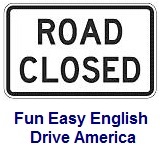 ﻿ Fun Easy English - Drive America - United States of America road signs, rules, and regulations regulatory, pedestrians. 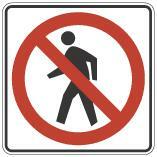 The regulatory road sign, pedestrian, directs pedestrians to do, or not to do something. The regulatory road sign, school, instructs road users that a school or the possible presence of students is ahead. Regulatory road signs for seat belts indicate that the use of seat belts is required. Pedestrians are not permitted to cross the designated area. 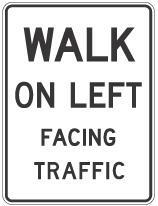 Pedestrians must walk on the left facing traffic. Pedestrians are permitted to cross the only when the traffic light is green. Pedestrians are permitted to cross only at the crosswalks. Pedestrians are permitted to cross only when the walk signal is showing. Pedestrians are instructed to push a button for the walk signal. Pedestrians are instructed to push a button and wait for the walk signal in order to cross the street. Pedestrians are instructed to push a button and wait for the green traffic light in order to cross the street. Pedestrians are given detailed instructions. 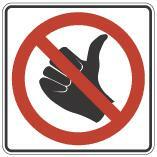 Hitchhiking, soliciting vehicle drivers for a ride, is not permitted. Motor vehicles are not allowed on the designated road. Non-motorized traffic, such as bicycles and pedestrians are not allowed on the designated road. Motor-driven cycles are not allowed on the designated road. 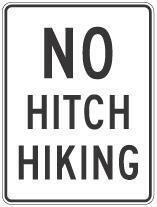 Pedestrians, bicycles, and motor-driven cycles are not allowed on the designated road. Pedestrians and bicycles are not allowed on the designated road. Pedestrians are not allowed on the designated road. Indicates that the use of seat belts is required. Reduced speed limit of 20 miles per hour (mph) is required in the school zone ahead when the signal light is flashing. Reduced speed limit of 30 kilometers per hour (kmh) is required in the school zone ahead when the signal light is flashing. Reduced speed limit of 20 miles per hour (mph) is required in the school zone ahead between the hours of 7:30 am and 8:30 am and again between the hours of 2:30 pm and 3:30 pm. Reduced speed limit of 30 kilometers per hour (kmh) is required in the school zone ahead between the hours of 8:30 and 5:30 pm. The school zone is ending. Required action when the signal light is flashing. Required action Monday thru Friday. Required action when children are present.